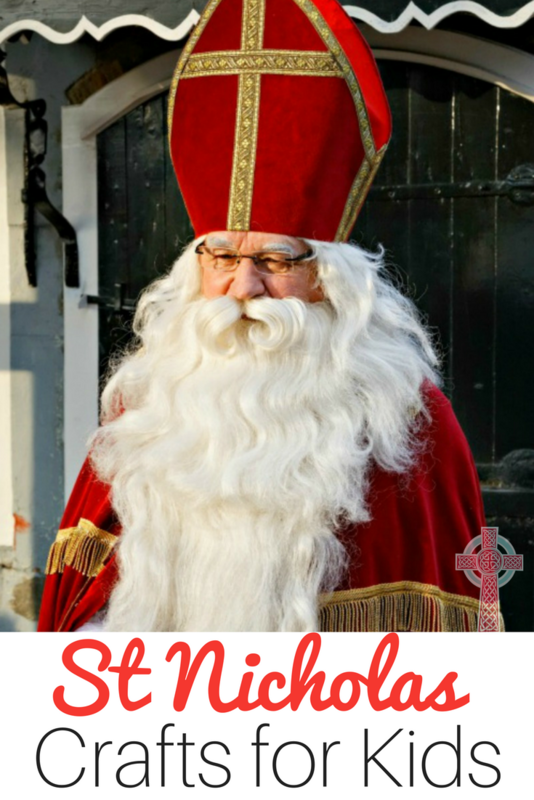 Are you ready to start planning your Saint Nicholas crafts? We’re going to be visiting one of our Orthodox Christian friends for the feast day, and I’m so excited! My kids have been exploring all of our Catholic Advent crafts for kids and they wanted some special activities to get ready for this special day. 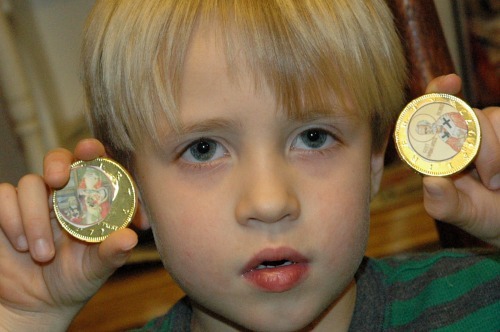 For a craft challenged mom like me, these St Nicholas coins are easy peasy. 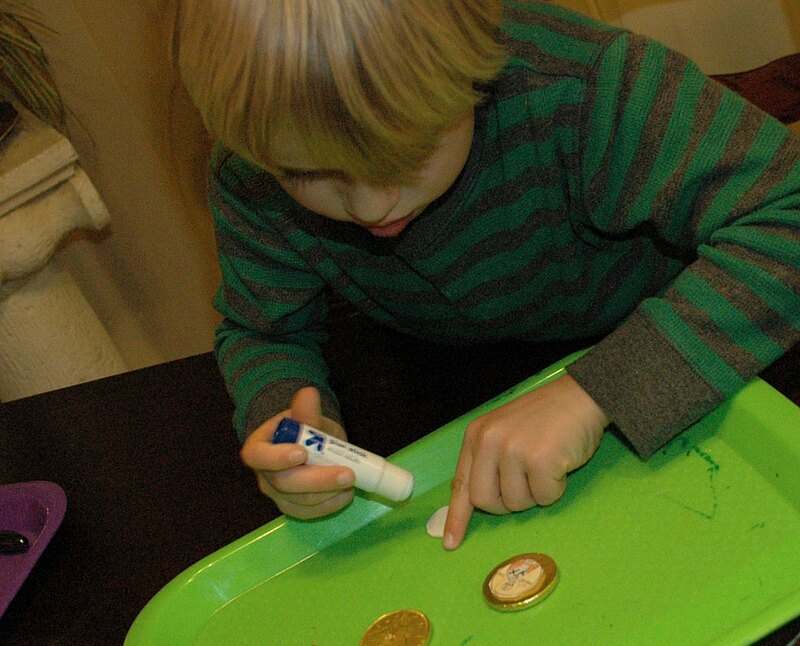 Set your kids up with chocolate coins and the St Nicholas templates and encourage them to glue the pictures on the coins. Working on gluing them together helps with fine motor skills, too! You’ll be all set with chocolate coins to celebrate the feast day! 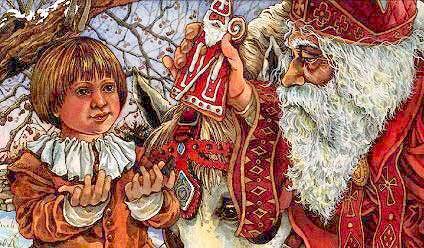 Before working on your Saint Nicholas activities, you’ll want to read some books with your children. Here are the resources we’ll be using. 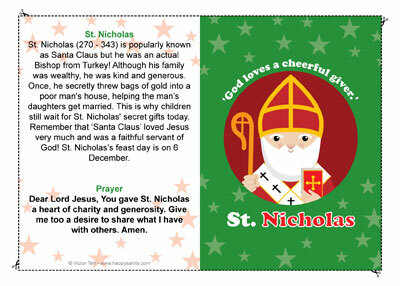 We also printed out copies of this St Nicholas prayer card and laminated it for durability. 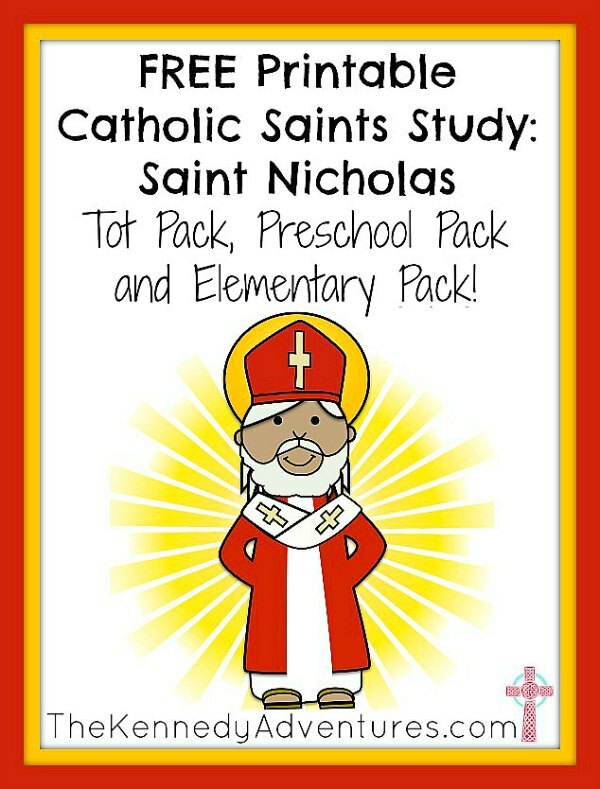 Don’t miss our Saint Nicholas Printables for children ranging from toddlers to early elementary aged children. These are perfect to work on while your favorite holiday cookies are baking! Have FUN celebrating this wonderful Advent season with your families! I love the prayer card, Dianna. Thank you! We celebrated St. Nicholas Day today — kids loved the little chocolates in their shoes when they woke up. 🙂 Thanks for linking with Collage Friday! Happy Saints has so many great resources! Thanks for coming by! Looking forward to hearing all about your trip! look at how fun this is – we’ve never celebrated St. Nicholas Day. We have so much fun with St Nicholas during the Advent season! It’s a blast! I LOVE this idea! I’m going to share it with the other Religious Ed. teachers at our parish. Thanks. I’m glad this is helpful, Susan! Our parish’s St Nicholas feast got snowed out this year …. but we do the chocolate coins, make a manger for Baby Jesus, create mitres and more! So much fun! This year St. Nicholas Day was very simple for us. I put coins in the kids shoes that I had found at Trader Joe’s in November. 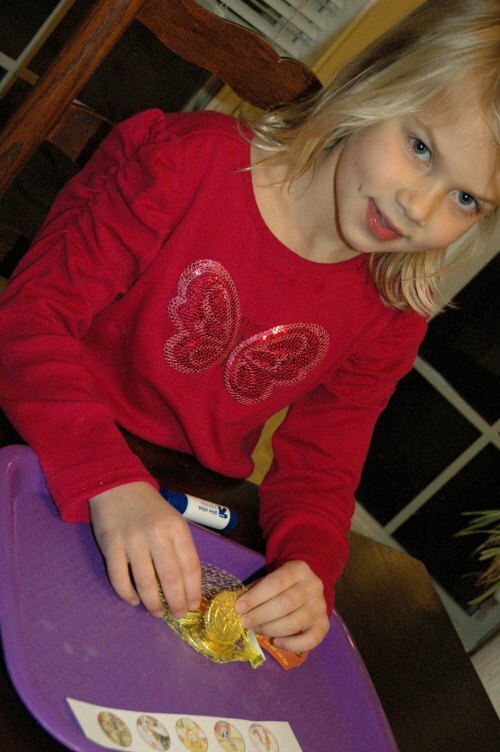 Other years, I have time to make St. Nicholas gingerbread cookies and decorate them. Thank you for the reminder about Catholic Cuisine; I had forgotten what a fantastic resource they are. We were all geared up for the big celebration at our parish, but it was snowed out. Argh! 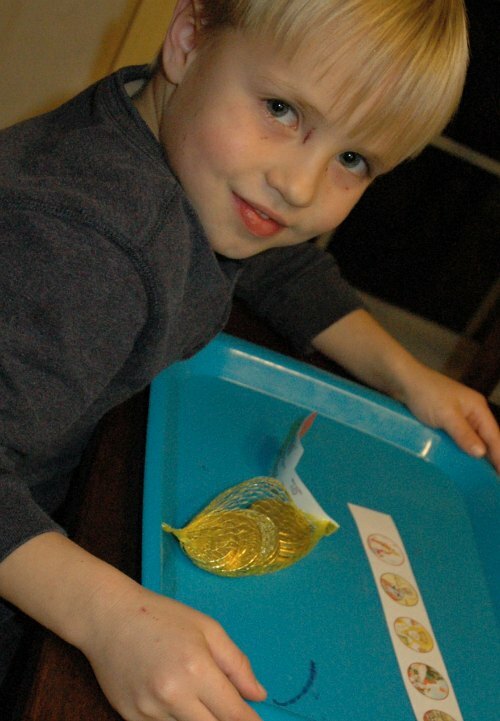 The kids had a BLAST with the chocolate coins! Catholic Cuisine has so much great stuff! Thanks for coming by, Ashley! What’d You Do This Weekend is a wonderful resource! Thanks for pinning our fun craft! I love this idea! Thanks so much for linking up to the Mommy Club Wednesday Linky Party! I’m Catholic as well, and have had a hard time finding crafts and ideas that would help my daughter using Catholic ideas – so I’m bookmarking your page! Thanks again for linking up, and we hope you link up again in the future. Would love to see what other neat posts you have! These are some great ideas! I’d love to buy some unit studies if I won a gift card.